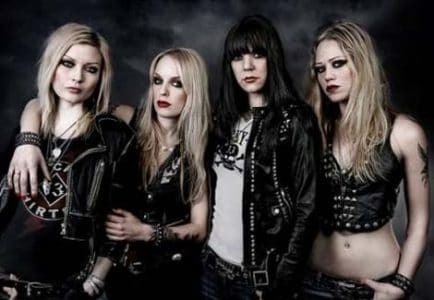 Back in mid-June 2016, all female rockers Crucified Barbara announced that they were calling it quits. Later on, the band’s singer Mia Coldheart resurfaced playing much mellower acoustic songs. The last year broke me. Touring, Playing, all the work behind the scenes, work to pay the rent and and be there online 24/7. The joy disappeared as the stress was on – a machine that delivers but doesn t live, to always be one step behind with the things to do and the decisions to be taken and performed. Face and arms numbed, anxiety, blurred vision, bad temper, constant worry – all because of exhaustion, we tried a break but it became untenable to just want a break. I was so exhausted in my head that I could start crying in the street in the middle of people. I wish that it could have ended in a better way, but I couldn t take it anymore. Now I feel better because I’ve got to rest. I am working on an acoustic album that I have wanted to make for a while, with Chips Kiesbye from Sator as a producer. I have put my artist name of the shelf and play under my real name, Mia Karlsson. I also play some live shows and explore new sides of my voice and my songwriting. It takes time because I’m not fully recovered, but it must be done so. Music can be both toxic and healing. Right now it’s my medicine. Me and Klara were only 14 years when we sneaked out smoking on her balcony and began to forge musical plans that would later become Crucified Barbara. For years Crucified Barbara and what the 4 of us did together were my main focus. I loved our band. Putting an end to our career and realize that life will never be the same has been among the hardest thing I’ve done. But what does a bass player in this condition do? Well, start a new band! I’ve always liked the concept of a band. Creating music and playing together with others is a must for my well-being. Putting down Crucified Barbara felt like being forced to break up with my first true love. A paralyzing fear that you ll never ever feel that strong again, that nothing will be as important. Although our history with Crucified Barbara was great for much longer than one summer between 9th grade and high school, the hard pain slowed down just like the crushed teenage agonies of love always slow down too. Sadness became relief and will to write new music. Me, Ida and Nicki has started a new band with 2 other musicians, and it’s now more fun to write and play music than it has been for many years. It´s liberating to start from scratch, not having to jump into the same old footsteps, but instead take detours and shortcuts straight to the music. This said, I miss our old band sometimes, but some things are better being a fading memory. You can read the rest of the article at The Crucifiers website including reading what drummer Nicki Wicked had to say.